Sterling Silver Charm with a puff heart and a flat star. The star has engraving on the edge. 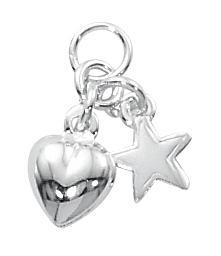 The heart and the star are approximately 2.6mm wide and the overall size of the charm is 10x9mm. The heart and star are on separate closed jumps and both of the jumps are attached to another closed jump. A final closed jump completes the assembly.